Stock photo where the foreground consists of one side of the Archer sculpture by Henry Moore. The curved monolithic edifices of City Hall as seen from the sculpture reach for the bright blues and whites of the sunny sky above. 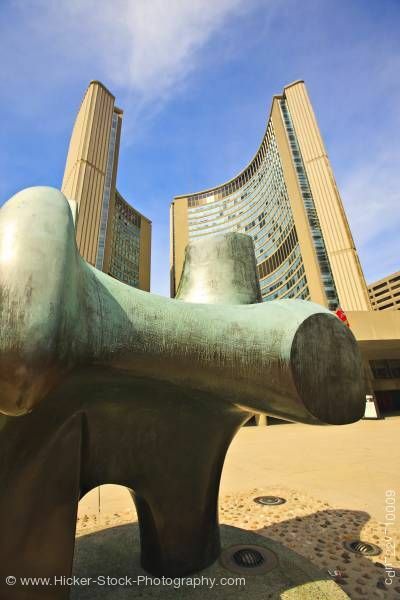 Stock Photos from the collection "Toronto"
This stock photo contains City Hall seen from beside the Archer sculpture (fine art by Henry Moore) in the Nathan Phillips Square, Toronto, Ontario, Canada. The sculpture as seen from close to ground level fills up the foreground. Behind it rise two curved smooth monolithic edifices of City Hall against a bright blue sunny sky with light clouds making up the top half of the picture. Related pictures with keyword "Toronto"